Show off your love for your precious dachshund every time you wear these personalized sweatshirts out on the town. Your family and friends will love the personalized touch on this special gift. Boast about your favorite family member in style! Our Dachshund Customizable Sweatshirts are available on our cotton/poly blend sweatshirts, machine washable in adult sizes S-3XL. Free personalization of any name is included. Additional Details This personalized gift would be great for any number of special occasions. The dachshund owners on your shopping list will definitely smile when they wear this special sweatshirt! 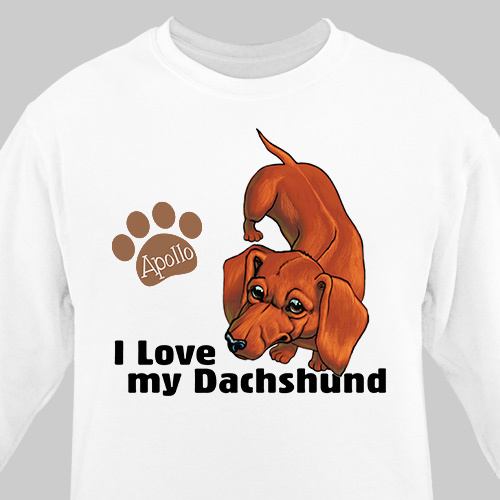 Our Personalized I Love My Dachshund T-Shirt is great for when the weather warms up a bit.